Marcie Place’s grandfather emigrated from Syria in the 1940s. Her father spent his weekends with his Syrian aunts learning to cook the dishes of his home country. In the decades that followed, he passed his passion for that food to his children. 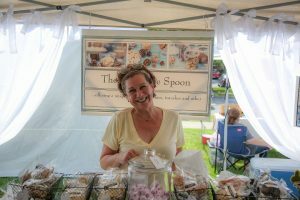 Today, Place, owner of The Chocolate Spoon, pours her love for Syrian food into many of her baked goods at the Saratoga Farmers’ Market. And even when she isn’t baking, she makes many of the dishes that her father mastered through his aunts. She especially looks forward to mid-summer when cousa comes into season. This lime-green squash is like zucchini, only lighter and a bit rounder. 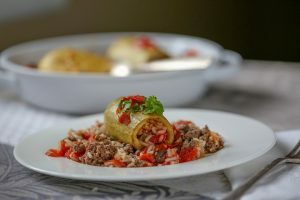 It is the base for one of her father’s favorite dishes – Stuffed Cousa, which is made by hollowing out the squash, filling it with a rice mixture, and then simmering it in a tomato broth. Place shared her father’s recipe with me, and a few weeks ago, Debbie Stevens of Butternut Ridge Farm told me cousa was in season. Since then, I have been buying it at the Wednesday market from her. Kokinda Farm also carries cousa on Saturdays. Cousa often is mixed into bins of zucchini and summer squash, which can make it hard to find. But the hunt is worth the effort. Stuffing cousa takes a little work, but it also takes advantage of some of the best of the market’s current bounty. Imagine heirloom tomatoes, basil, newly harvested garlic, sweet pepper, and the satisfying crunch of summer squash. That’s cousa with its added touches. It emerges from its cooking broth looking a little like a sausage and tasting sweet and spicy. Use whatever broth is left as a simmer sauce for meatballs or, as I did, for fish. Stevens said cousa is a favorite among eastern European customers who like it stuffed. Stevens enjoys the squash sautéed, as a side.